How many times have you heard the expression, "Sometimes you just want a burger and a beer"? With the arrival of a number of upscale and high-end restaurants in the Greater Boston area and elsewhere in Eastern Massachusetts (some of which are outstanding), this phrase seems to be heard quite often these days, especially since it can be nearly impossible for most people to spend $100-200 at a French or New American spot on a regular basis. And while the region has plenty of good places to get a burger and a beer, there are precious few full-service sitdown restaurants that focus solely on this. For those who live on the South Shore, you do have one (well, two, actually) that fit the bill perfectly here, as KKatie's is indeed a burger bar that is the ideal spot for a burger and an adult beverage or two. The focus of this review is actually on the second location of KKatie's, which is in Marshfield and is closer to Boston than the original (that one can be found in Plymouth, about 10 miles to the south--and there's one in Hyannis now as well). Residing in the center of town just east of where Route 3A south splits off from Route 139, KKatie's is one of several small businesses in the small downtown area and is a good stop on the way to the beaches a few miles to the east. The restaurant, which is accessed down a side alley off Ocean Street, is rather small and narrow, with high-top seating to the right and a bar with additional seating to the left (the two are partitioned off somewhat by a narrow bar rail), and on a weekend night, there can be a bit of a wait because of the relative lack of seating. KKatie's has a funky and fun vibe overall, and the space is attractive, with a sleek bar, a dark wood floor, a high ceiling with circulating fans, exposed brick, and windows along the back and right walls that allow some light in. You could probably deduce from the name that KKatie's Burger Bar is all about the burgers, and while it does have good takes on chicken sandwiches, turkey burgers, and veggie burgers, it is their freshly-made 100% Angus Beef burgers that the vast majority of diners order here. A few options include KKatie's KKrunch Burger, which is topped with bacon, cheese, and potato chips; a Juicy Lucy stuffed with American cheese; a Hell Burger with pepper jack cheese, jalapenos, and hot sauce; a Pretzel Burger that can be ordered with pastrami or bacon and is placed in a toasted pretzel bun; a zingy black and blue burger with Cajun spices, blue cheese, and blue cheese dressing; a Good Morning Burger that is topped with a fried egg; and something called The Plymouth Rock, which consists of four quarter-pound burgers topped with bacon, cheese, and onion rings. Starters and sides include stuffed quahogs, house-made chips, tater tots, clam chowder, terrific fried pickles and banana peppers, and nachos, while the drink list includes a variety of bottled beers, a rotating list of beers on tap, and wine. Even though burgers are "hot" these days, the Boston area (and Eastern MA) has surprisingly few full-service burger restaurants, which makes those who live on the South Shore particularly lucky to have a place such as KKatie's Burger Bar. This dynamic little spot seems like one that could do well closer to Boston, and since the Marshfield one is a second location, perhaps there is hope that this could indeed become reality at some point. 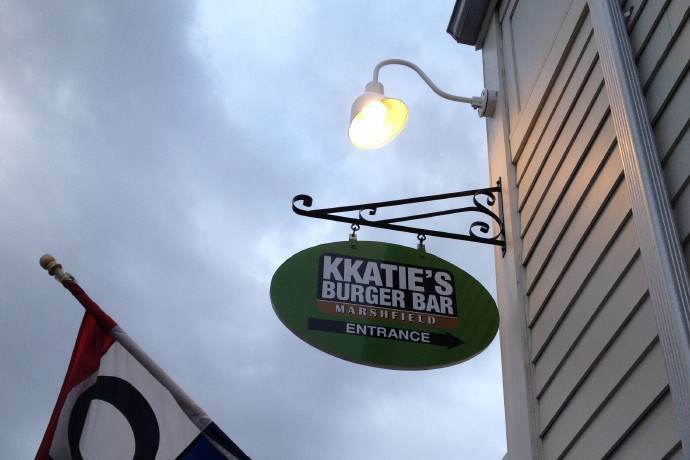 But while that might just be a dream for now, it really isn't that bad of a ride to KKatie's in Marshfield, as it is less than a half hour from the Boston line, and well worth going to if you like burgers (and beer). Copyright © 2015, 2016, Boston's Hidden Restaurants (www.hiddenboston.com).